A few years ago my husband brought home some discarded test press vinyl records from the music company where he worked. 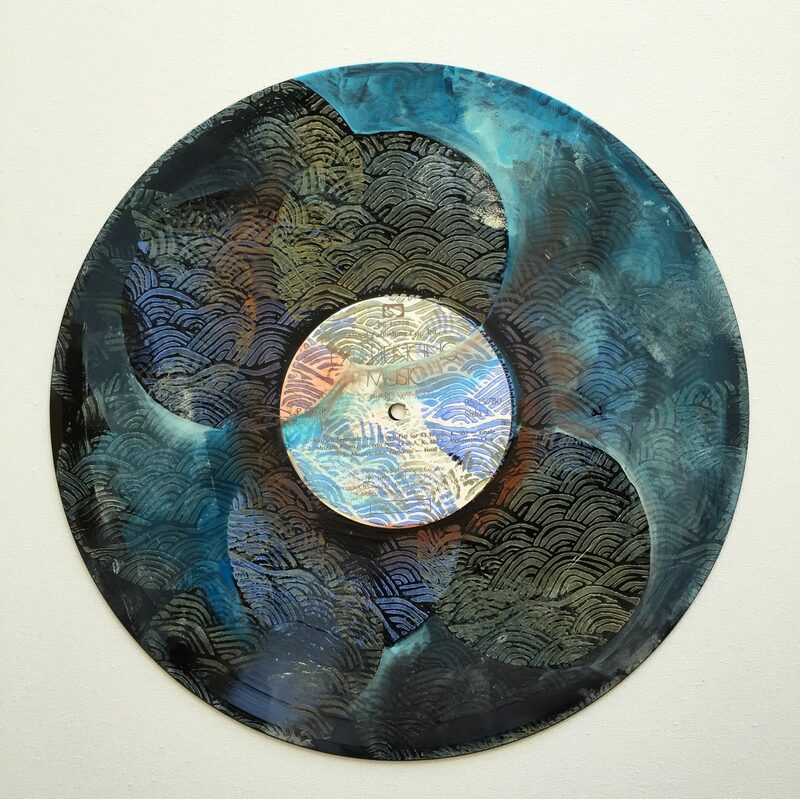 He knew that I was drawn to non-traditional art materials and surfaces and had a feeling that I would enjoy painting on the vinyl records. His intuition was correct and once I started painting on the vinyl records, I was quickly hooked. The circular form of the records and the grooved surface provided an engaging and joyfully challenging surface to work with. I experimented with paint markers and acrylic paint and began to figure out the best way to apply the paint and markers. My earliest pieces in the series were mostly paint marker on an acrylic background. I posted them on my art site for sale before the holiday season, and was excited when people started showing an interest in them and buying them. The first collection is now sold out, and in the past few months I have been working on a second collection for an upcoming show. Details coming soon! 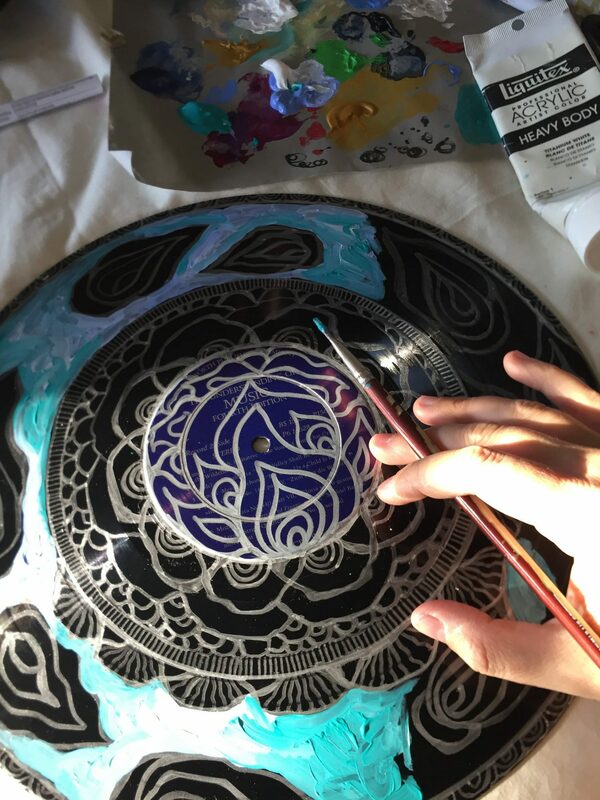 I’ve received a lot of questions about what type of materials I use to create the vinyl record mandalas in addition to people looking for tips for working on vinyl. I love sharing ideas for art materials and my process. Of course there is no right or wrong way to do this. (You knew I was going to say that, didn’t you?) But here are some materials and tips that might help jump start your own explorations. Paint: I mainly use acrylic paint in combination with paint markers. In terms of the brand of paint, it’s really a matter of personal preference and budget. I tend to buy a combination of higher end professional acrylic paint but also fill in with less expensive (but still very good quality) acrylic. The two professional grade paints that I use the most are Golden and Liquitex acrylic paint. Spend some time on the Golden and Liquitex sites if you’re interested in learning about the different types of paint they carry. There’s a lot of helpful information, tutorials, and art examples. I will often use the ‘Basics’ line of liquitex which is slightly less expensive but nice to work with. 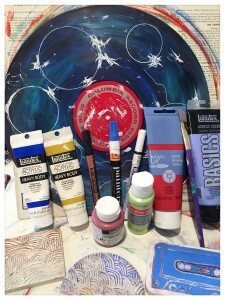 Some of the art materials I use to create the vinyl mandalas ~ acrylic, paint pens, & hand carved stamps. Many art and craft stores also carry a house brand. For example, Michael’s carries a brand called Artist Loft and I have found that paint to be economical and good quality. There are many different brands of paint pens and markers. Some are oil based and some are water based. I only use water based markers. I don’t like the smell of the oil based markers. My favorite brand at the moment is Sakura Pen Touch Markers. They come in a variety of colors and pen tips. I often use the white pens on darker acrylic backgrounds. The metallics also create striking line work on top of a darker background. Since there are so many brands of paint pens and markers, my advice is to buy 1 or 2 of each brand offered when you walk into the art store or order them. They are not usually very expensive. Then experiment with the brand, pen tips, and colors to see what you enjoy working with most. The one other thing I will mention is that paint pens do dry up rather quickly so I’m always replenishing my supply. In addition to acrylic and paint pens, I have been creating my own rubber stamps and using them on some of the vinyl pieces. The tape cassette mandala (second image down from the top) was created using a stamp that I carved out of an oversized eraser. Using stamps in conjunction with painting and layers helps give the mandalas an added depth and level of complexity. Plus, the process of carving each stamp is enjoyable in and of itself. Using stencils and collage are two more techniques that can help build interesting layers. I repeatedly use my circle stencils to block out smaller mandalas within the vinyl record mandala. It can take some practice in order to get comfortable with working on vinyl. 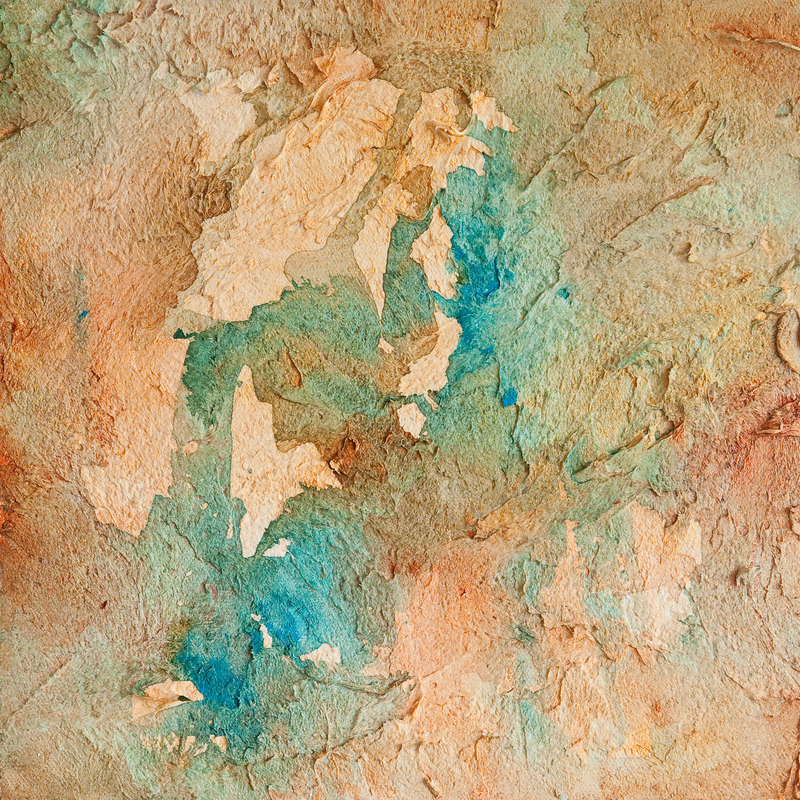 The grooves and variations interact very differently with the paint then canvas does. I usually don’t use much water with the acrylic because it will start to slide of the vinyl if there is too much liquid. Try applying the paint more thickly. Keep in mind that there is a natural flexibility to the vinyl record. This is a great aspect of it and acrylic is a naturally flexible plastic. Still, if paint is applied very thickly then it could crack if the vinyl bends too much. It’s an interesting dance between rigidity and flexibility. I enjoy the creative tension inherent in this process. And this brings me to the art therapy component…. 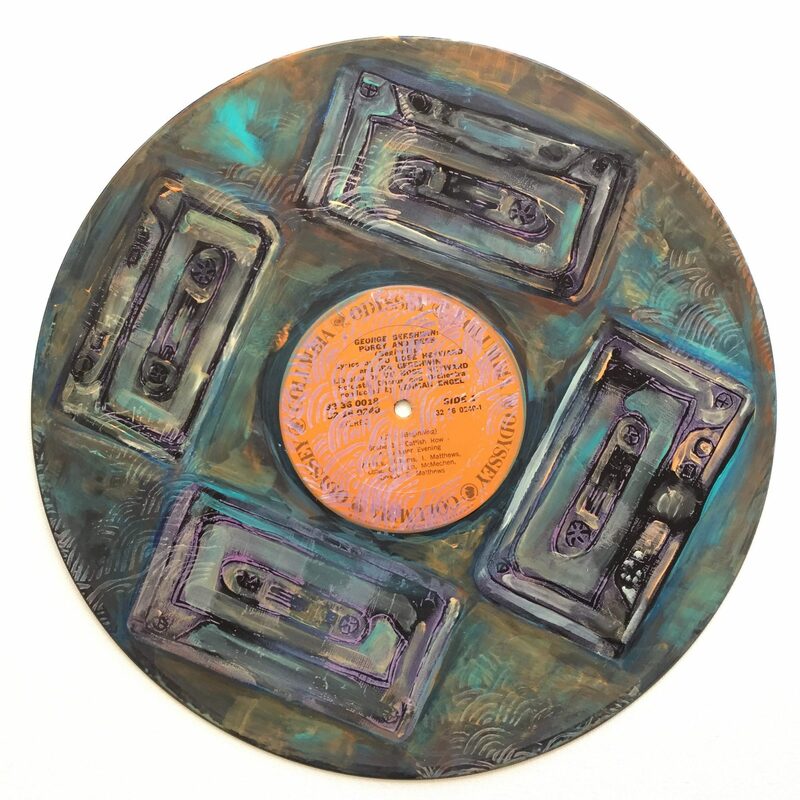 When I was working at a few different adult shelters in NYC I brought vinyl records in to my art therapy groups a number of times. My clients were immediately intrigued by the alternative surface. Many of them fondly recalled listening to records when younger. 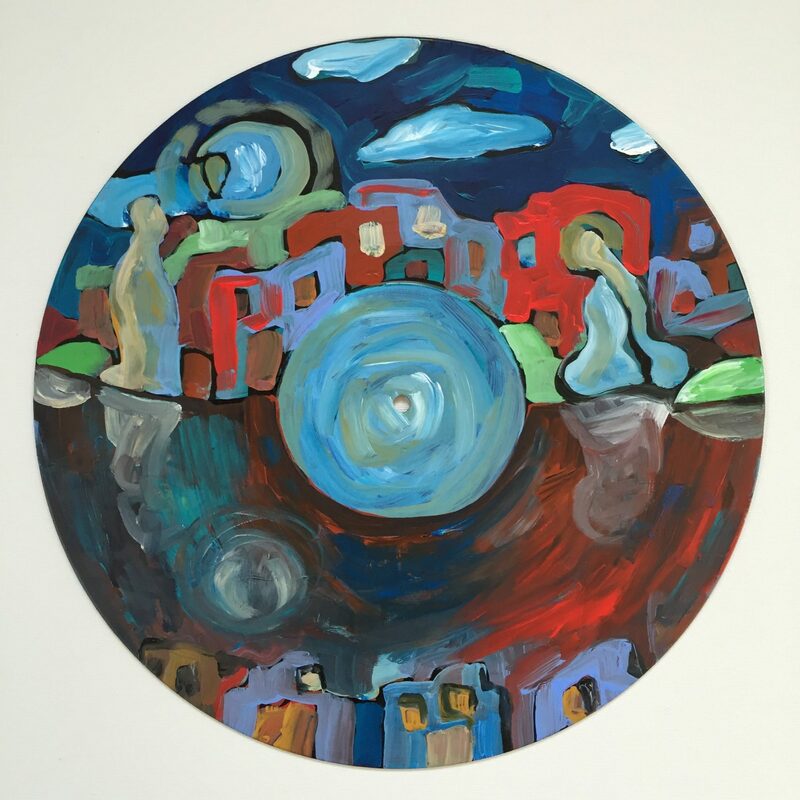 I would often open the group up by asking clients to imagine that they were about to paint the soundtrack to their lives. I asked them to envision the album cover and the record artwork. 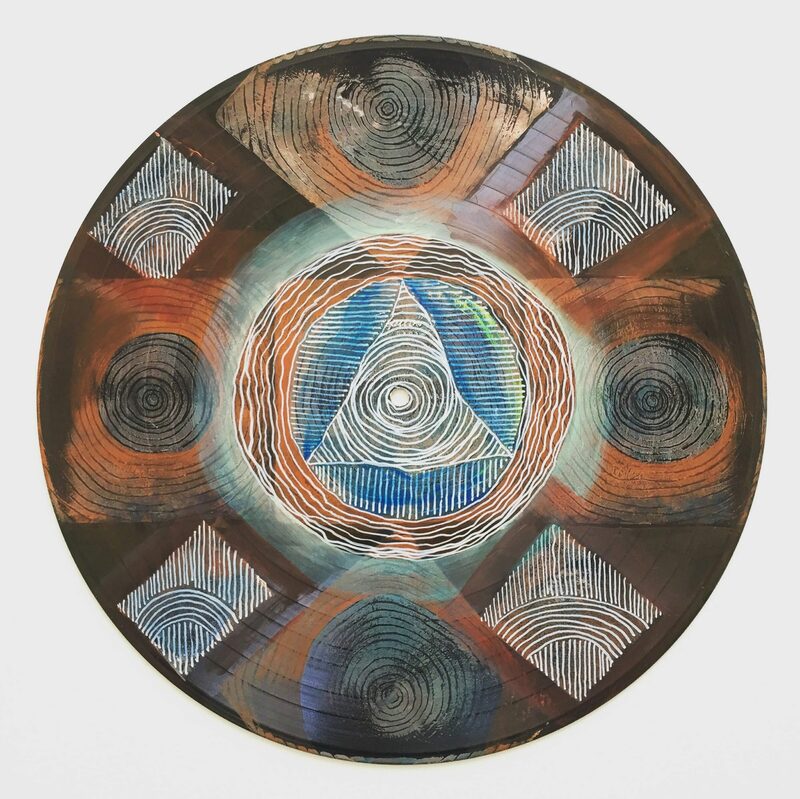 After they had meditated on this for a while, they would often begin to paint on the record. If there was time at the end of group, many of them spontaneously created track lists for their piece. The song titles were just as illuminating as the visual aspects of the records. Those who were inclined would then share the finished record mandala and the album cover and track list if they had come up with something. The process was playful and yet deeply engaging and meaningful. Most of my clients took the painted records back and hung them up in their temporary rooms at the shelter. The pieces became conversation starters among other clients and staff members. Months later, a few of these same clients visited me at the shelter and said that the record had been the first thing that they hung up in their new apartment after finding housing. 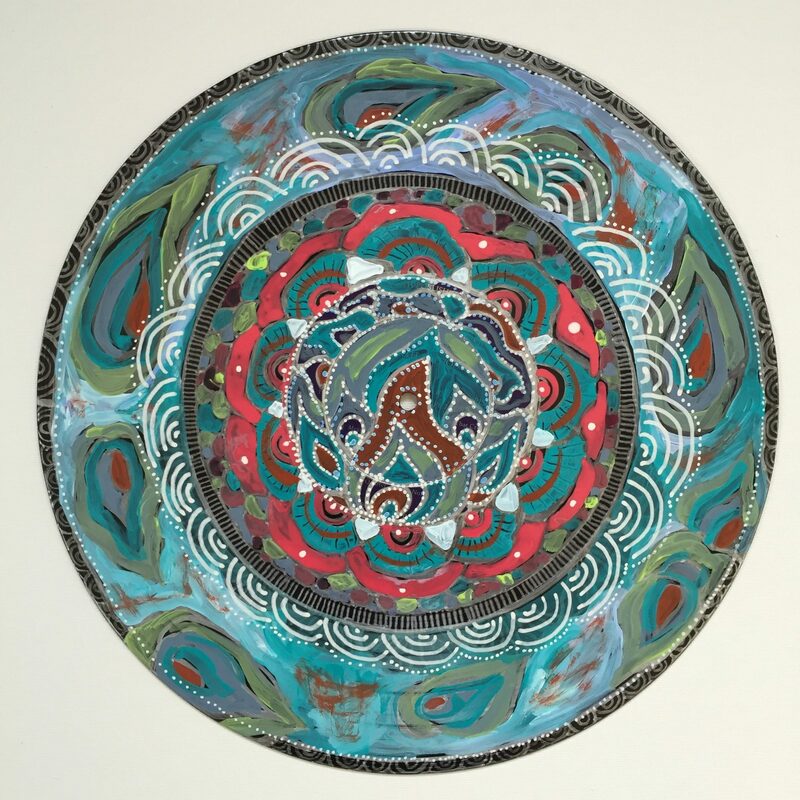 If you’d like to read a little more about my vinyl record mandalas, check out this interview I did with a lifestyle magazined called Llamas Valley. My vinyl record mandalas also popped up on Bored Panda a while ago, which was a neat surprise! 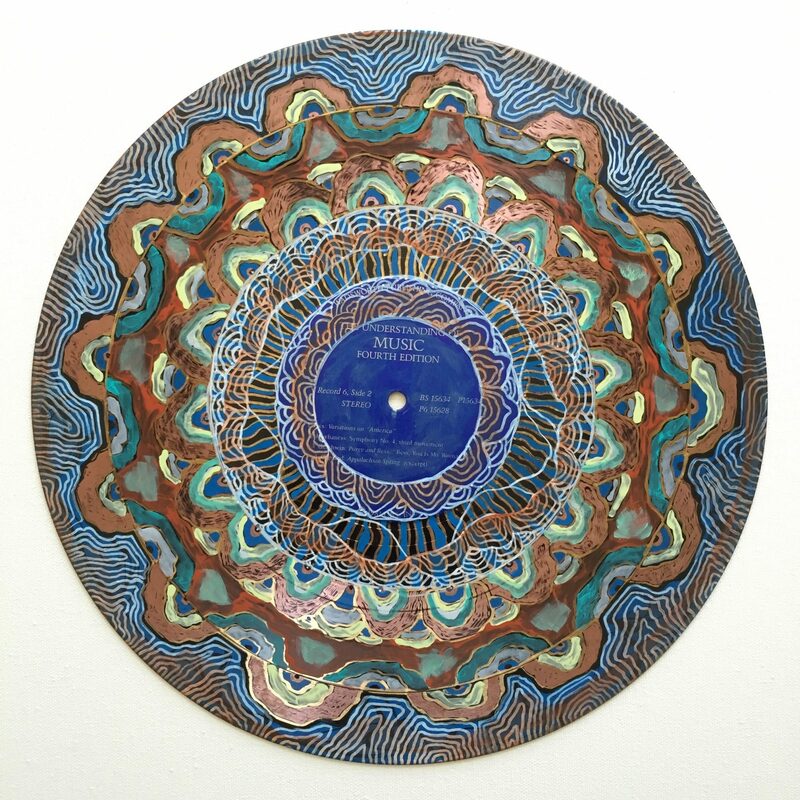 Stay tuned for more vinyl record mandalas. In the meantime, why not try picking up a few used records and experimenting with some record art too? Share your explorations here. I’d love to hear about them.